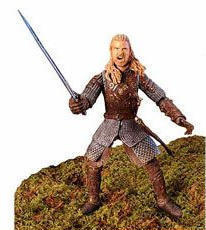 The Two Towers - Eomer - 6"
Size (inches): 2.95" X 7.87" X 12.01"
Kids can pretend they may be the celebrities of the subsequent installment in the Lord of the Rings trilogy with these fairly distinct, utterly poseable motion figures. Each item comes with real character-dedicated accessories and has an action function, that replicates a key action sequence from the film. The laser-scanning technology used in their production guarantees the dead-on likeness of each movie figure. Even the foremost discriminating collectors would possibly not trust their eyes. More Photographs - The Two Towers - Eomer - 6"
End of More Photographs - The Two Towers - Eomer - 6"